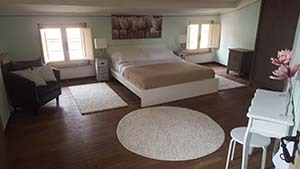 B&B Chez Nous was born from our family’s desire of escape from a big city like Rome. We wanted to realize our dream of live among nature and the horses. 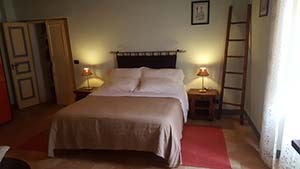 The B&B is situated in Città della Pieve, near Perugia, and it lying on an hill at the edge between Umbria and Tuscany. It dominates from above Trasimeno Lake and Val di Chiana. It’s the perfect starting point to discover Umbria, Tuscany and Lazio, because it’s situated near Chiusi Chianciano Terme train station and near Highway A1, by which you can get to Siena, Perugia, Assisi, Orvieto, Todi, Montepulciano, Pienza e la Val D’Orcia. The apartment is situated at the second floor of one of the Noble Buildings in Città della Pieve, along one of the most important street of the old town, Garibaldi street. It is crafted of the finest quality materials, the spaces are wide and bright, thanks to the position and it has a beautiful view on Val di Chiana. The two wide rooms are equipped with private indoor bathrooms, comfortable beds and all the comfort you need for a relaxing holiday.